A layer of rich, black terra preta lies atop a layer of light brown, nutrient-poor rainforest soil near Manaus, Brazil. In the heart of the Amazon rainforest lie small plots of fertile ground. Soils in tropical rainforests are notoriously nutrient poor, but the dirt that fills these plots is so rich that the locals sell it as compost. 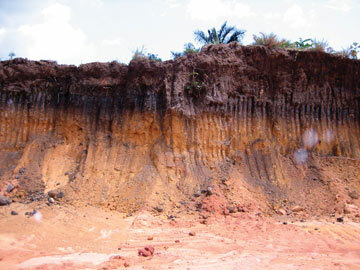 This soil — called terra preta, Portuguese for “black earth” — did not form by accident. Scientists speculate that it marks the spots where pre-Colombian civilizations once burned their refuse in small, smoldering piles. The leftover charcoal gave the soil below a long-lasting supply of carbon that continues to boost fertility hundreds of years later. Today the ancient idea of supplementing soils with charcoal is making a comeback as researchers search for new sources of renewable, non-polluting energy. Heating organic waste in an environment with little or no oxygen generates renewable fuels such as syngas and bio-oil, but it also produces charcoal. “The charcoal, or char, has always been a byproduct that we didn’t know what to do with,” says Robert Brown, director of the Center for Sustainable Environmental Technologies at Iowa State University in Ames. Now they do: If they add the charcoal to soil, it breaks down at a snail’s pace — over hundreds (if not thousands) of years. This slow rate of decomposition means not only that the soil is more fertile during this time, but also that carbon is sequestered. 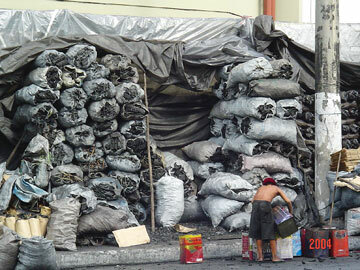 At this charcoal market in Manaus, Brazil, charcoal is packed into small and large bags before being sold. In an ideal world, the process works more or less like this: Organic wastes — everything from manure and wood chips to corn stalks and nutshells — are fed into a kiln where they are heated. Instead of burning, the biomass chars, releasing energy-laden gases that can then be captured. Depending on the conditions inside the kiln, the process produces “syngas,” which is rich in hydrogen, methane and carbon monoxide, or bio-oil, a thick, dark brown liquid that can be used as a fuel or further refined to produce syngas, ethanol or even gasoline. Both syngas and bio-oil can also be broken down to form industrial chemicals. And the byproduct, charcoal, can be used to enrich soils. The system is meant to be self-sustaining (some of the fuel produced goes to heat the kiln) and carbon negative. Farmers often leave crop residues and other organic wastes until they decay, or they burn them. Both activities release substantial amounts of carbon dioxide. But if those wastes are converted to charcoal and spread on fields as a soil additive, 30 to 65 percent of the carbon gets trapped and sequestered until the charcoal breaks down. Studies suggest that charcoal — also called biochar or agrichar — can boost soil fertility in a number of ways: It attracts microbes, traps moisture in its tiny pores and helps the soil hold nutrients. “What we came to appreciate in the last five years or so is this is not the same thing as adding manure,” says Johannes Lehmann, a soil scientist at Cornell University in Ithaca, N.Y. “It’s much more efficient.” In fact, Brown tells the story of a farmer who added charcoal to his sandy soil and saw his next crop double in yield. At the Embrapa research station in Manaus, Brazil, researchers study nutrient dynamics and crop yields in charcoal-enriched soil in a banana plantation. Why has the idea of adding charcoal to soil been so slow in making a comeback? Christoph Steiner, a soil scientist at the University of Georgia’s Biorefining and Carbon Cycling Program in Athens, wonders the same thing. Four years ago, he wrote his dissertation — Slash and Char as Alternative to Slash and Burn — on this very topic. “I have been waiting for years for this to take off,” he says. According to Brown, the scientists who know about terra preta and the engineers who know about fuel production didn’t get together until about two years ago, when the International Biochar Initiative held its first meeting. “You didn’t hear about it before,” he says. But despite the mounting interest, many questions have yet to be answered. Not all charcoal is created equal: Wood chip charcoal is not the same as peanut shell charcoal or corn stalk charcoal — or the charcoal found in terra preta, researchers say. Even charcoals made from the same feedstock can differ depending on the conditions inside the kiln: Temperature and the presence of oxygen during heating affect the charcoal’s composition. For instance, charcoal heated at higher temperatures is coarser and less cohesive, Brown says. Not all soil is created equal either. “There’s no question that you get lots of positive effects when you put [charcoal] on soils that are highly weathered,” says Randy Killorn, a soil scientist who works with Brown at Iowa State. “We’re wondering what kind of an effect it will have on the soils like we have in Iowa.” He and his colleagues spread biochar made from corn stalks on test plots a year ago. But they have yet to see positive or negative effects. It could simply be too soon, Killorn says. Or it could have something to do with the charcoal they’re using or the soils in the region. Even charcoal enthusiasts are willing to admit that charcoal won’t be beneficial everywhere. 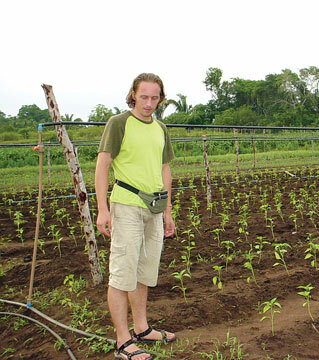 Christoph Steiner, a soil scientist at the University of Georgia, stands in the midst of a field of pepper plants in Brazil. These plants are being grown in terra preta — soil enriched hundreds of year ago with charcoal. 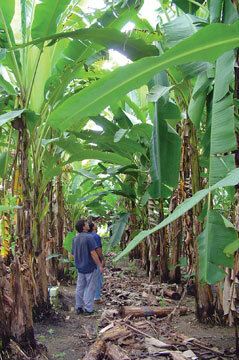 The ordinary Amazonian soils do not support such productive agriculture. Questions remain regarding the ability of charcoal to sequester carbon too. A study published May 2 in Science reported that charcoal, because it increases microbial activity, can speed up the decomposition of organic matter in certain kinds of soil, thereby releasing more carbon into the atmosphere. The researchers looked at leaf litter in a boreal forest, but David Wardle, a soil ecologist at the Swedish University of Agricultural Sciences in Umeå and the paper’s first author, expects the same processes would apply on agricultural lands. “I don’t think the extra decomposition would totally negate the sequestration effect of charcoal,” he says, but it would certainly partially offset the benefits. Yet Harold Collins, a microbiologist at the U.S. Department of Agriculture’s Agricultural Research Service in Prosser, Wash., hasn’t seen any evidence of increased decomposition in his experiments. He and his colleagues have been tracking microbial activity in silt loam and sandy soils by measuring the amount of carbon dioxide produced in the lab. If adding charcoal to soil speeds up decomposition of organic matter, Collins would expect to see a rise in carbon dioxide after they added the charcoal. Yet, after 150 days of monitoring, he and his colleagues have yet to see any change. “There doesn’t appear to be any stimulation at this point,” he says. Of course, those researching the benefits of charcoal are not the only ones interested in getting their hands on organic wastes. Crop residues and other leftovers can also go to fuel the production of cellulosic ethanol. However, Brown says, “we can take a much wider diversity of materials.” No biomass is so moldy or dirty it can’t be converted to charcoal. Even the residues left over after biomass becomes ethanol can be charred.